During the long, dark, telly-less winters of old in the Dalarna region of central Sweden, dads would sit by the fireside and carve wooden toys for their children. The most popular of these was a stout little horse, modelled on the animals used to haul timber from the woods. By the 19th century, these painted horses had become objects of desire for a market beyond the forests, and a cottage industry developed, with carpenters and furniture-makers turning offcuts into horses. 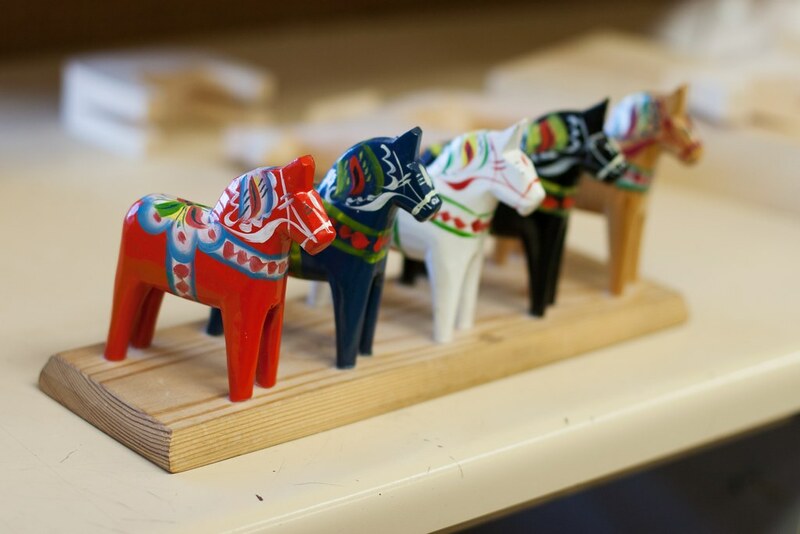 In 1939, a giant Dala horse was shown at the New York World’s Fair, making the transition from local knick-knack to internationally recognised symbol of Sweden. Travel to Stockholm or Gothenburg now and you’ll see vast herds of the beasts on sale, painted in the traditional bright red or in more exotic colours and designs, but the best are made in the lakeside village of Nusnäs, deep in the forests 180 miles northwest of Stockholm. It was here in 1928 that brothers Grannas Anders, Nils and Jannes Olsson worked out a way to streamline production, using a hand-pulled band saw to cut the basic designs. Nearly 90 years later, production is all but unchanged. The rough-cut horses are sent out to carvers across the region for whittling into shape and then passed on to the painters for decoration. Production is limited to 500 horses a day, most of which are painted in traditional red, with a harness in white, green, yellow and blue, although the company also finds time to produce Dala pigs and roosters, too. Don’t be swayed by these distractions. You need a horse, and prices start at 190 SEK (£16) for a 4in pony, rising to 13,200 SEK (£1,125) for a mighty 30in stallion. CHRIS HASLAM writes for The Times.